This is one of the easiest recipes I've ever tried and is now one of my all time favorites! I was watching Everyday Food, and as is often the case, I wanted to run right out to the store to get the ingredients. (Actually, I already had most of the ingredients in my pantry!) If you know me, you know that I never met an apple dish that I didn't like and that turkey dinner is my all time favorite in the whole wide world. So this clearly falls into the "how can this not be good?" category. One of the best things about this recipe is that it doesn't take long to do the prep work, and then you don't need to babysit it once it's in the oven. You just leave it in the oven and let it do its thing. It's perfect for the novice cook. Basically, if you can peel an apple and cut an onion, you can make this dish. And just wait 'til you taste it! 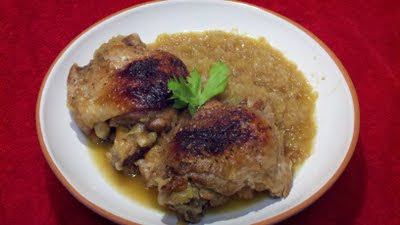 The meat becomes fall-apart tender and the apples cook down into the most fabulous sweet and sour apple sauce you've ever tasted. So simple, but SO brilliant! Serve it with a green veggie and some roasted potatoes and you have the perfect weekend supper! In a medium Dutch oven or heavy pot, heat oil over medium-high. Season turkey on both sides with salt and pepper and add to pot, skin side down. Cook until skin is golden and crisp, about 8 minutes. Transfer turkey to a plate and add shallots to pot. Cook until shallots soften, about 5 minutes. Add apples and cook until slightly softened, about 5 minutes. Return turkey, skin side up, to pot; add cider and broth. Bring to a boil, cover, then place pot in oven. Cook 1 1/2 hours. Uncover; cook 30 minutes more. Remove pot from oven and transfer turkey to a plate. Skim fat from cooking liquid and stir in vinegar. Slice meat off bones and serve turkey with apples and pan sauce. If you don't have shallots, you can certainly use thinly sliced onions. Just let them cook slowly over a medium heat until they get nice and soft and sweet and mellow. Be sure to add the cider vinegar at the end. It's seriously a key ingredient that gives the apple sauce that little sour zing that totally makes the entire dish. If you don't have a cast iron dutch oven, just use any oven proof heavy pot. It's absolutely worth the investment, though. Make sure you put it on your wish list!